Velobici: How is sending three returning one different from capture three recapture one ? Should we have both pages, or should they be combined into one ? Velobici: So we are saying that the sending three means playing self-atari as opposed to the more general case of capture three, recapture one. 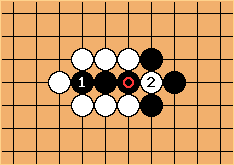 Upon further review, Weiqi Rapid Drill 800 Problems uses the Chinese term 打三还一 for capture three, recapture one. Thank you, this answers my question.